Welcome to Mountain Village Resort and Stanley, Idaho! 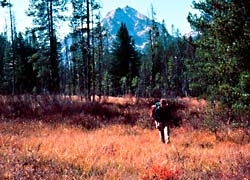 The town of Stanley sits at the base of the majestic Sawtooth Mountains. The Sawtooths (also known as "The North American Alps") have 42 peaks over 10,000 feet and more than 300 crystal clear high mountain lakes. A vacation or business conference in Stanley will surely create life long memories that will come back to you again and again. You may be coming to whitewater raft down the Salmon River; fish for steelhead or 10 other species of trout; hunt for trophy elk, mule dear, cougar, bear or mountain goat. It may also be to snowmobile, cross-country ski, showshoe, mountain climb, hike, bike, camp, backpack, or go horseback riding. There are also the ghost towns, scenic drives, wildlife viewing, or just relax in our "Natural Hot Springs" (guests only) at Mountain Village Lodge where our goal is to pamper and cater to your every need. No matter what your reason is for choosing Mountain Village Resort and Stanley, Idaho, the awesome scenery alone is enough to make the words vacation, business conference and Stanley, Idaho synonymous. Welcome to the best the west has to offer - Mountain Village Resort - Stanley, Idaho!